Kashmir shawls are the Indian subcontinent’s most unique achievement. To most people, collectors and users alike, shawls are easily the most recognizable, attractive, and luxurious textiles. Skilled craftsmen, using the rarest materials, produced in an unusual structure carefully woven shawls. We know from records that the emperor Akbar had his wardrobes full of Kashmir shawls, and they were his prized possessions. The TAPI collection has a range of outstanding examples. The earliest shawls in the TAPI collection are some fragments dating to the early 17th century. 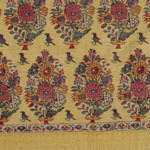 Kashmir shawls were known as Kani or Jamewars, and were woven in twill tapestry technique. Many times they were woven in thin strips, then joined together by a rafugeer. Shawl designing and weaving was a complex and labour intensive procedure and the final product was very expensive. The shawls were a popular item for export.